Is this Husker Red Grandpa? Just went on my first road trip to Lincoln to see Grandpa and Grandma Russell. I also met my cousins Owen and Devon for the first time along with Aunt Jenni and Uncle Logan. 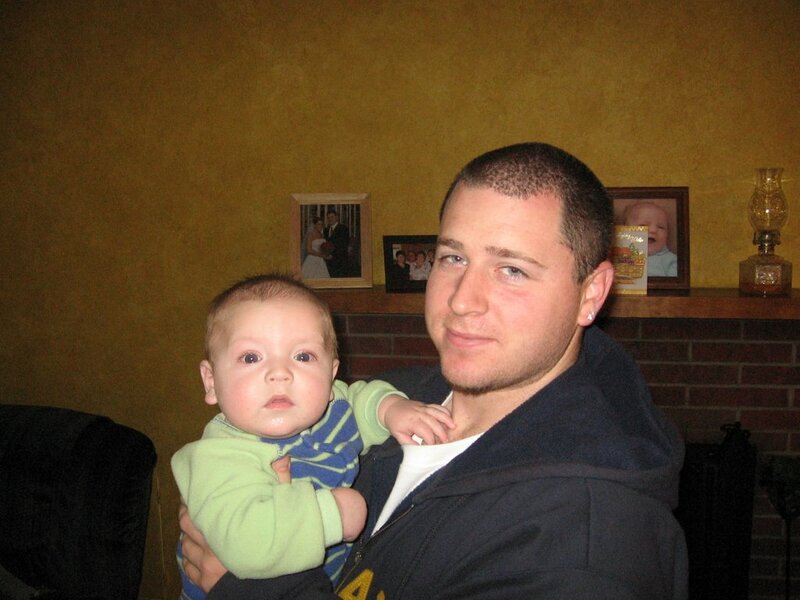 This is a picture of me and my Uncle Matt. He's cool although he's a Notre Dame fan and not a Husker or Cyclone. I can tell he's going to be teaching me lots of stuff as I get older. I did good on the ride out to NE, but the ride home is another story. Just to drive Mom nuts I decided I'd cry for about 2 hours. I didn't want anything, just felt like crying. I think I was just tired from the weekend but it was awesome meeting some of my family for the first time. Looking forward to Christmas with them! the site looks great! love to see these new and updated pictures!!!! they grow so fast, don't they?! I'd say that is one proud Uncle Matt!